We said good-bye to our first baby girl, Chayla, on Sunday. It was incredibly hard, but also somewhat of a relief – she was diagnosed with osteosarcoma, a very aggressive cancer, just before Thanksgiving. The tumor on her shoulder had grown to about the size of a tennis ball. She was in pain, but Sunday was the first time we looked into her eyes and they were sad. It was time. We took her for a short walk, her favorite thing, but also something she hadn’t done in a month at least. Then she went on a car ride, which was probably her second favorite thing. She got a great dinner the night before and a great breakfast, and plenty of treats. She was so excited to go for her walk, more excited than she’d been in a while. It was a good last day. We were able to sit with her and hold her the entire time. I wouldn’t have it any other way. She slipped away peacefully, and I am grateful for that. Life won’t be the same without her and already our small house seems very empty. This was her playful pounce. This is the picture posted on the rescue group’s site, the picture that made us fall in love with her. She went with us to the cabin every year at least once. I’ve never been to the cabin without her; it won’t be the same. We’re going to bury her two collars – one at home, one at the cabin. We’ll be burying her Mizzou collar there – a little humor, as the cabin is in Arkansas. This is Chay on the boat. She loved the boat, loved having the wind in her face. I loved that she was there with me, making me laugh. She was so good at that. This is a picture of Chay and her best friend, Hank. Hank belongs to our best friends who live in Columbia (though he might argue that they belong to him). They tolerated one another for a while, until the night we left them alone and they managed to tear through a whole bag of pigs ears. From that night on they were best friends. Chay was getting on in years, and though she was robbed of a lot of good life, she was a lazy girl. But Hank brought out the puppy in her. They were so darn cute together. I could go on and on forever about Chay. She was our first baby, our best girl, for 6 ½ years. We knew she was ours the minute we visited her at her foster home. We just clicked. Chay had been in and out of homes for a few years, never fitting in. But the three of us were perfect together. Everyone loved Chay, she was so special. She had a way of digging into your heart and staying there. It will be a while before we get another dog, though I know someday we will. 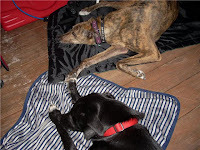 I don’t know that I can face the thought of losing another to this horrible cancer, which is very common in greyhounds (and I would only ever get another hound). Maybe when Bee is a little older. Maybe when we’ve got a bit more disposable income. Good-bye, sweet girl. I know now you’re running freely, eating all the cheese that you want, living it up. We will meet again. why didn't I know about this earlier?? ?